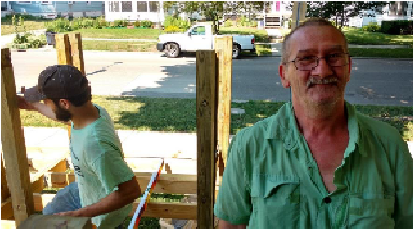 Habitat for Humanity received a grant this past May for continued support of their Wheelchair Ramp program to help seniors remain in their homes. Through King's Daughter's Organization since 2015, 35 ramps have been completed with plans for 15 ramps this year. Please see below for one recent success story of the program. The Ramsey family - mom and dad Andrea and Charles, and siblings Amber, Jake and Heather - stick together. Through a variety of challenges, they continue to love and look after each other. 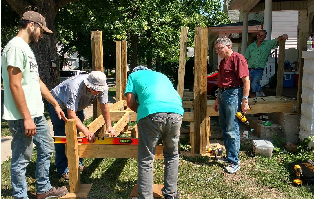 Getting a wheelchair ramp, thanks to Habitat of Humanity of Sangamon County and King’s Daughters Organization (KDO), is an answer to their prayers. Little by little, the family has figured out ways to make it work at home. This ramp is key helping the Ramsey family stay together. Life can change in an instant. HFHSC is grateful for this partnership with KDO that is ramping up access, safety and peace of mind for qualifying low-income senior homeowners in Sangamon County. The King’s Daughters Organization Fund at the Community Foundation for the Land of Lincoln awarded Habitat for Humanity of Sangamon County (HFHSC) $15,000 for its home accessibility program, which installs wheelchair ramps for qualifying senior homeowner. Applications for the HFHSC program are available online at www.habitatsangamon.com or at the office located at 2744 S. 6th Street in Springfield.